Day 6: Incredible Mass at the Tomb of Christ! The wake up call came at 4:30 AM. Argh! “You will thank me later,” I told the pilgrims. We left the hotels at 5:00 AM to walk the Via Dolorosa (Stations of the Cross). After walking the Way of Sorrows we quickly toured the Church of the Holy Sepulchre before settling into the benches set up for us and Mass began with pipe organ and singing Franciscans. Everyone was moved by the Mass! You can enjoy a bit of it on my video. Then we had a group picture and then breakfast with two hours free to regroup or nap. We took off again for Bethesda and St. Ann’s Church, before arriving at the Western Wall for the morning of Bar Mitzpah’s. Everyone then had the afternoon off to scatter through the Old City. 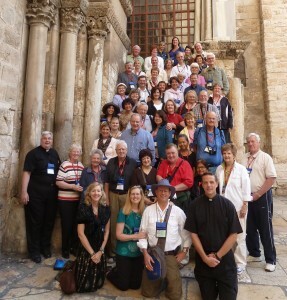 Most went back to the Holy Sepulchre to enter the tomb and to touch the top of Calvary. We ended the day with a marvelous tour of the Notre Dame Holy Shroud Exhibit before dinner. We love the YouTube videos and blog! We have a couple of comments about one of your group members though..
1- Please send the woman with the Muslim Prayer Shawl home to take care of her grandbaby soon. We were glad to hear she has been renewed and has a newfound energy from her trip… she’s going to need it to care of a 4 week old. 2- Her oldest granddaughter wants to know why she was left out of the saying hello on the 1st day’s video, when she just mentioned the 2 youngest ones. Thank you Steve for giving her another opportunity on Day 4 to redeem herself and say hello to all her grandchildren. 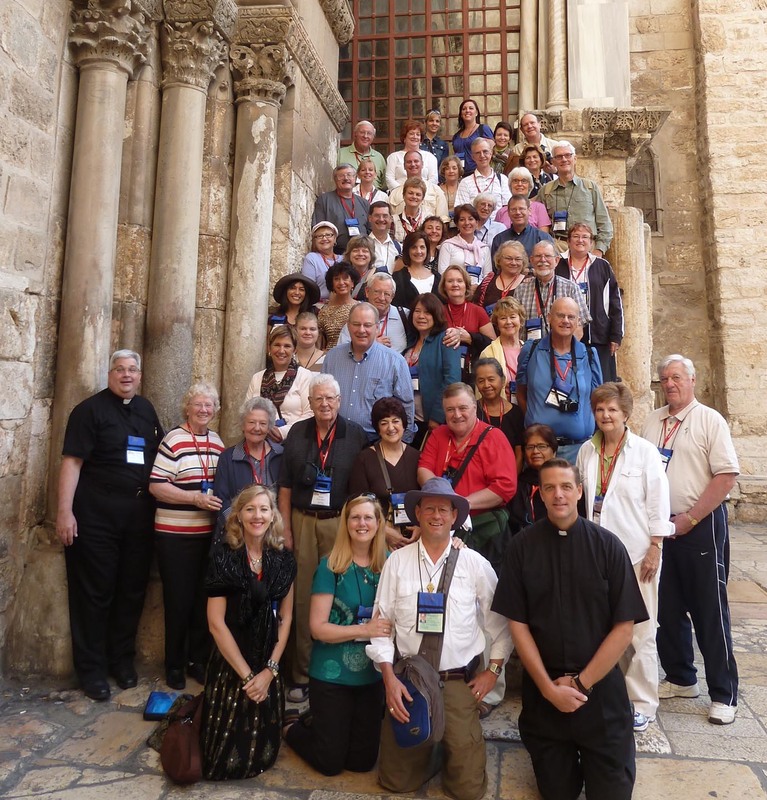 3- We love her red shirt.. nothing like standing out in the Holy Land. 4- Everyone should keep up the dancing… looks like fun and that you’re all ready for Dancing with the Stars! We’re praying for everyone and wish we could be there! These videos are incredible! I have been tuning in every night after work. Such a blessing! Thank You! Hello to Father Stephen and Cindy from Lisa Saturno and Teresa Garcia. Teresa came over to watch the videos on the computer and she says this to you, “I am very happy you are in the Holy Land and I am watching your journey. Michael and I are watching together and we love you both very much (con mucho amore “simpre”)”. Hope you’re having a great time. Saw some pics today! Jen is wondering if you are coming to Aunt Judy & Uncle Don’s party. If you are able to RSVP to me, let me know. Hope you’re having a great time. We saw some pics of you today online! Jen Gratien is wondering if you are coming to Don & Judy’s party. Somehow the RSVP was lost in translation. If you can let me know, great. If not, don’t worry about it till you come home. Just finshed eating dinner with Dad and watching all the posts. Hope you are doing well and have a safe flight home.